BELMOPAN, Mon. 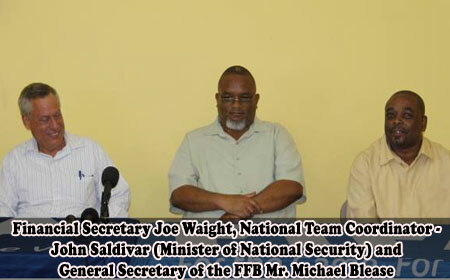 July 13, 2015–The Government of Belize, through the Ministry of Finance, officially handed over a BZ$125,000.00 grant to the Football Federation of Belize (FFB) today, July 13. The grant was approved by Cabinet from the Petrocaribe Fund to help them meet the national team’s training and travel costs leading up to Round 3 of the 2018 FIFA World Cup Qualifiers. The grant was presented to the FFB by the Financial Secretary Mr. Joseph Waight, who on behalf of the Government extended well wishes to the National Team and assured future support from the Government as the team progresses in the games. Present at the ceremony were a few of the team players, Minister of National Security and National Team Coordinator Hon. John Saldivar, and the General Secretary of the FFB Mr. Michael Blease, who received the grant on behalf of the federation. Both Minister Saldivar and Mr. Blease expressed their gratitude to the Government and said that they look forward to the continued support.